Situated atop a mountain ridge 10 miles from Long Mountain Lodge and surrounded by vineyards, The Winery at Wolf Mountain commands a spectacular view of the rolling foothills of the Appalachian Mountains. The Old World ambiance of our Cellar and Cask Room sets the stage for our labor intensive protocols which focus on a less invasive use of gravity, minimizing the need for filtration. Our Award Wining wines are hand crafted with emphasis focused on making the highest quality wines possible. The wines at Wolf Mountain are more European in style than Californian. As a result, we use 100% French Oak Barrels for the aging of all our wines. The emphasis is on the rich fruit flavors our terroir offers and not on excessive oak flavor. Our philosophy is to blend our grape varieties to achieve more complexity, as is done throughout Europe, where the climate is similar to the North Georgia mountains. Our 25 acre Vineyard estate is home to plantings of Cabernet Sauvignon, Syrah, Mourvedre, and Touriga Nacional. The beautiful Winery at Wolf Mountain is fashioned after a raised, Craftsman-Style cottage and sits atop the cellar which is encased in fieldstone and houses a presentation of early wine-making artifacts. Only 4.9 miles from Long Mountain Lodge and at the heart of the Montaluce Estate and at its highest point, the property boasts a modern 25,000-square foot winery building. Reminiscent of a grand Tuscan villa, with sweeping views of the vineyards and mountains beyond, guests will discover here the Italian ideal of "La Vita Bella," or the beautiful life--centered around food, wine and sharing. On the winery's main floor, the handsome Tasting Room and beautiful restaurant Le Vigne offer a place to unwind and enjoy New- and Old-World Italian dishes alongside a thoughtful wine list that includes selections from the United States as well as Italy. On the lower levels, guests may observe the fine art of winemaking in our production facility that comprises more than 9500-square feet. In the fall of 2008, Montaluce will harvest its first grapes and our innovative gravity flow winery will be fully operational. Montaluce is dedicated to growing and making premium wines, which will compete, favorably with other premium wines around the world. We invite you to experience the beauty of our vineyards and taste the quality of our wines as Montaluce takes its place as one of the premium wine estates located on the Dahlonega Plateau, one of the truly unique emerging wine-growing regions of the United States. Come tour and taste from barrel with the winemaker, tour the vineyards with our vineyard manager, participate in Wine University, take a culinary class with our chef or simply sit back, relax and enjoy the wonderful world of wine and dining at Montaluce—the heart of North Georgia Wine Country. Three Sisters Vineyards & Winery is a small family farm situated on a hundred and eighty acres in the heart of the Frogtown District in historic Lumpkin County, Georgia. Located 18 miles from Long Mountain Lodge and eight miles northeast of the site of the first major US gold rush, Dahlonega, the farm's name was inspired by the property's spectacular view of Lumpkin County's Three Sisters Mountain. While no one knows the origin of the name of Three Sisters Mountain, local residents refer to its three distinctive peaks as Wild Cat, McBrayer, and Rattlesnake. 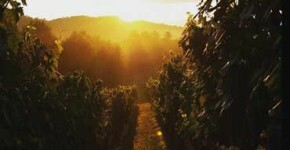 Established in 1996 and bonded in 2000, Three Sisters Vineyards holds the distinction of being "Dahlonega's First Family Farm Winery." Three Sisters Winery began production during August of 2000 and is Lumpkin County's first bonded farm winery since prohibition (BWGA43). All of our family members are involved in the wine making process. The first harvest produced nearly 2000 cases. Current production is nearly 4000 cases. French & American oak barrels and stainless steel tanks are used in production and aging of our estate wines. All of our wines are handcrafted from 100% Georgia grown winegrapes from Lumpkin County's very first vineyard, using old world traditions and the lastest technology. 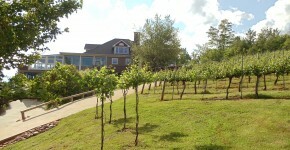 Three Sisters Vineyards' property is located in the Frogtown community of Lumpkin County in the Chestatee River Valley. Elevation is 1800 feet above sea level. We believe it is the "perfect place" to grow a wide variety of winegrapes. Sharon's brother Ken VanDusen joined the family business in 1996 and acts as Vineyard Manager. Pictured are Georgia Commissioner of Agriculture, Tommy Irvin planting the "ceremonial first vine" with Sharon and Doug Paul on May 1, 1998. Three Sisters is proudly Lumpkin County's very first vineyard & farm winery since prohibition times. Three Sisters Vineyards has planted over 13,000 premium wine grape vines (vitis vinifera, French-American and Native American varietals) covering eighteen-plus acres or organized vineyard space. The 184 acre farm vineyard features Cabernet Franc, Merlot, Cabernet Sauvignon, Pinot Noir, Pinot Blanc, Touriga, and 3 distinctive clones of Chardonnay-as well as the French-American hybrid, Vidal Blanc and the East Coast's popular Native American varietal Cynthiana-Norton. Planted in the spring of 1998, the vines are in six to seven by ten foot row spacings. Three Sisters uses several different trellis systems-including VSP (Vertical Shoot Positioning) and GDC (Geneva Double Curtin). Frogtown is a 57 acre wine estate located 17 miles from Long Mountain Lodge at the foot of the Appalachian Mountains equal distance between Dahlonega and Cleveland Georgia. Frogtown encompasses 28 acres of vineyards and a tri-level gravity flow winery specifically designed to produce the unique wines made from Frogtown grapes. 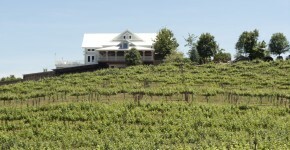 In 1998, native Atlantans Craig and Cydney Kritzer founded Frogtown in a location carefully selected for quality wine grape production and outstanding mountain views, the Frogtown District of Lumpkin County, Georgia. After researching Frogtowns soil, diverse climates and terrain, Craig divided the land up into separate vineyards. He planted different wine grape varieties based on the characteristics of each vineyard site. Frogtown is now home to 28 acres of vineyards planted to 15 different wine grapes varieties, both red and white. Cavender Creek Vineyards and Winery, a small family farm vineyard, located 10.7 miles from Long Mountain Lodge, got its start- with the volunteer help of family and friends- in 2007 with the planting of our two red grapes- Cabernet Sauvignon and Norton/Cynthiana- with first harvest in 2009. The third plot- Petit Manseng, a small white grape- was planted in 2008 and premiers its first vintage in the Spring of 2011. 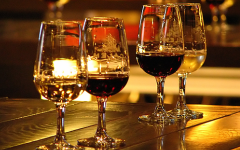 Cavender Creek Vineyards & Winery endeavors to produce hand-crafted wines that reflect the personal attention to detail and “pampering”- from planting to bottling– afforded by a small family vineyard. 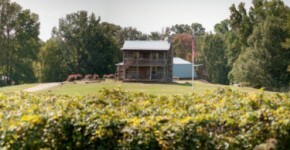 Planned around an “old family farm” theme, Cavender Creek Vineyards & Winery features a c.1820 hand-hewn log cabin, disassembled and moved down from Tennessee. Several tasting rooms / shops are located around thd Dahlonega Square featuring Georgia wines. 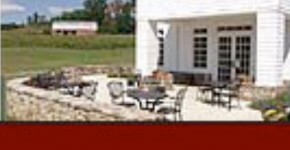 The Cottage Vineyard & Winery, the area's newest is set amongst the scenic North Georgia mountains is just a few miles from HIstoric Dahlonega, Georgia and Long Mountain Lodge. The amazing views all year round will astound you for natures beauty alone. Come for a short visit or stay for the day! 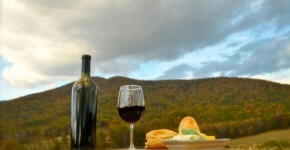 Enjoy some of our local cuisine on their covered deck with a glass or bottle of Georgia grown wines, highlighted by a breathtaking 180-degree panorama view of the vineyards and Appalachian Mountains. 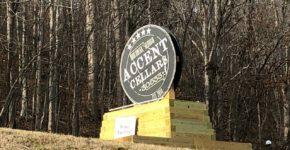 Accent Cellars celebrates a healthy relationship between man and nature through hand crafted wines & ciders. Their passion is rooted in the privilege of being a part of the shared experience of enjoying a good bottle with good friends. So grab a picnic, some good company, a bottle of wine, and settle into the good life. Open daily and only 2 minutes from the Dahlonega town square.